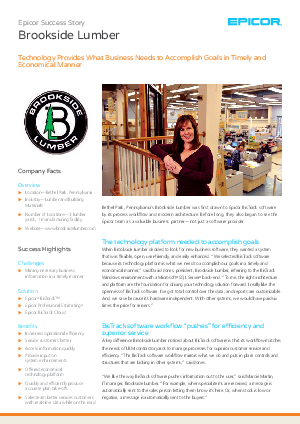 Brookside Lumber—a Pennsylvania-based lumber and building materials (LBM) dealer—needed a new business software system that was flexible, open, user-friendly, and easily enhanced. They wanted a solution that could get them the data they needed to accomplish their goals in a timely manner. That’s where Epicor BisTrack came in. Read this case study to learn more about how Epicor BisTrack was able to help Brookside Lumber, and discover how it can also help your LBM business. Download the case study now.